The following itineraries all start and finish in Valdez, a beautiful coastal town in northeast Prince William Sound, nestled amongst snow-capped peaks of the Chugach Mountains. I guide through Anadyr Adventures, a kayak company in Valdez that has been offering tours since 1989. Contact me for info on how to make reservations. Take a look in my photo gallery and blog for inspiration. I’ll help you choose the itinerary that best suits your trip needs and goals. All prices are per person. Fully guided means I take care of everything. I provide all the equipment, camping gear and food. I do all the cooking and cleaning, so you can relax and explore more! Guide assisted is for those with prior camping experience. I will still provide all of the paddling equipment and whatever camping gear you might need. The only difference is that you provide your own food and do your own cooking and cleaning. Scroll to the end for information about the best time to plan your trip. May through September is the kayak season. New to kayaking? Want a great refresher trip to practice and refine your skills? Looking for a fun adventure to gain new skills with the safety net of an experienced and certified guide? This exciting and unique trip offers the same opportunities as the other tours to experience the best of Prince William Sound, Alaska; its glaciers, wildlife, mountains, and breathtaking wildness. The bonus of this trip is a focus on learning basic sea kayaking and camping skills. Some of the topics include: menu-planning and food preparation, gear selection and care, kayaking strokes, reading tide charts, group management when there’s icebergs floating in the water, rescue techniques, VHF radio communication, and packing a kayak for an expedition. You’ll come out of this trip with the knowledge, confidence, and skills to enjoy safe and fun paddling adventures on your own. This trip shares the same itinerary as the Glacier Island to Columbia Bay 4-day that you’ll find below. The difference is that this trip adds on a day at the beginning in Valdez learning and practicing skills. We’ll don dry suits (provided) and practice paddling strokes and rescues in the port. We’ll also spend time in the kayak shop learning about gear preparation and trip-planning logistics before we begin the real adventure the following day. Kayak yoga before making the plunge! Camp with the sound of waves rushing over rocky beaches and icebergs rumbling in the background for three nights of awe-inspiring Alaskan wilderness. This trip is suitable for all levels of paddlers and campers who wish to explore and experience the magic of Alaska while improving their knowledge and skills, however novices and beginners will benefit from the instruction and skills-based focus. This trip offers an exciting and well-rounded glimpse into the diversity of Prince William Sound. From serene bays, tidal pools and old-growth forests, to up-close wildlife encounters, rugged coastline with cavernous sea-caves, impressive glacier views, and dazzling icebergs, this trip has it all! Explore the dramatic south side of Glacier Island, where hundreds of Sea Lions, Puffins and lots of other wildlife abound, including Humpback Whales, Orcas and Bald Eagles. Then enter Columbia Bay, where the iconic Columbia Glacier, the largest tidewater glacier in Prince William Sound, calves majestic icebergs into the water. Paddle amongst the intricately-carved ice with the towering snow-capped peaks of the Chugach Mountains as the backdrop. Sea Otters, Harbor Seals, marine birds, and old-growth boreal rain forest will also highlight this trip. This trip is suitable for all levels of paddlers and campers who wish to explore and experience the magic of Alaska. This trip adds a day to the 4-day trip (above) for exploration of the face of Columbia Glacier. Diverse wildlife, boreal forest, rugged coastline, sea caves, towering icebergs, serene bays and coves, cascading waterfalls, pristine beaches, glacial moraine, and the dramatic recently-revealed landscape from the retreat of the largest tidewater glacier in Prince William Sound. This unique trip is Alaska at its’ best! Glacier Island, with its’ rugged coastline and sea caves, is home to numerous bird and marine mammal species, including Horned and Tufted Puffins, Bald Eagles, Harbor Seals, Sea Otters, and the chance to view bear, Humpback Whales and Orcas. A highlight is paddling amongst Steller Sea Lions, as the island hosts a large haul-out for these playful and active animals. It’s a dream-come-true for wildlife enthusiasts. This trip takes us into Columbia Bay, one of the most breathtaking and dynamic bays in the area, ringed by the majestic and snowy glaciated peaks of the Chugach Mountains. We will explore the popular bird-nesting site and often ice-dotted glacial moraine, where Columbia Glacier sat until the start of its’ retreat in the early 1980’s. The peaceful boreal forest and distinct coves of this bay and its neighbor, Heather Bay, are home to a delightful diversity of birds, ducks and mammals, including Arctic Terns, Loons, Bald Eagles, Harbor Seals, and Sea Otters. At certain times we can observe salmon returning to their natal streams. If conditions allow, we will paddle the recently-exposed shoreline all the way to the face of this impressive glacier, as it calves icebergs into the water, an unforgettable and powerful experience for all to witness. This wilderness trip-of-a-lifetime will allow you the feeling that you are experiencing the best of Alaska’s dramatic and awe-inspiring environment. Camp with the sound of waves rushing over rocky beaches and icebergs rumbling in the background for four nights of awe-inspiring Alaskan wilderness. Along with the Shoup Glacier 2-day itinerary and wildlife-viewing opportunities (see below), this trip also includes a night and day to explore the peaceful and extremely beautiful Sawmill Bay, a haven of old-growth boreal rain forest, streams and waterfalls, and muskeg dotted with wildflowers and berries (seasonal). There is also a salmon run that occurs in Sawmill Bay at certain times, which offers the unique opportunity to paddle directly over hundreds of salmon swimming upstream! With the majestic snow-capped peaks of the Chugach Mountains as the backdrop, you’ll be glad you opted for more than one night! While in Sawmill Bay, camp with the relaxing sounds of the forest, as the tide moves in and out. In Shoup Bay, the soft rumblings of the glacier will sing you to sleep. This trip is suitable for all levels of paddlers and is especially appropriate for beginners, as it is the second shortest camping trip. Experience the joys of sea kayaking amidst the best of what Prince William Sound has to offer on the shortest camping trip. This is for the time-strapped or beginner camper/paddler. The picturesque Shoup Glacier pours down from the snow-capped Chugach Mountains, its’ beautiful blue face sitting just above sea level. Exploratory hiking alongside the glacier promises to inspire and impress, as you peer at different ice formations, such as caves and crevasses, as well as glacial waterfalls and streams. Curious Harbor Seals pop their heads up near your kayak, as you discover the bustling rookery of many nesting Black-Legged Kittiwakes, a small seabird. Many other marine birds, Bald Eagles and Sea Otters often make an appearance in Shoup Bay. This trip also includes paddling the beautiful shoreline between Shoup Bay and the town of Valdez, which includes a historic mine site, bubbling waterfalls, wildflowers and berries (seasonal), rocky coastline, and the opportunity to view wildlife, such as Bald Eagles and other marine birds and ducks, Sea Lions, Sea Otters, Harbor Seals, and even possibly porpoise, salmon, whales and Orcas. Camp inside Shoup Bay and be lulled to sleep by the tranquil sounds of water and ice. This trip is suitable for all levels of paddlers and is especially appropriate for beginners. This incredible trip is for the adventurous soul who wants to experience the awe-inspiring wilderness of Prince William Sound for a 7-day expedition. This longer trip offers the opportunity to get into the rhythm of kayak touring on a true wilderness expedition, learning about the natural history of the area, while witnessing the best of coastal Alaska. Weave your way amongst ice and Harbor Seals as you paddle close to the face of Meares Glacier to watch pieces of ice calve into the water. Explore beautiful and tranquil bays, as well as dramatic and rugged coastline. This trip also includes paddling the itinerary of the 4-day Glacier Island to Columbia Bay trip (see above), which includes paddling amongst Sea Lions and towering icebergs, with the majestic snow-capped peaks of the Chugach Mountains as the backdrop. This trip offers the most opportunities to view the exciting wildlife in the area, such as Sea Lions, Sea Otters, Harbor Seals, Humpback Whales, Orcas, Salmon, and many different marine birds, including the Tufted and Horned Puffin. This trip offers camping in a great variety of settings, from beautiful rocky beaches to peaceful old-growth forests. Each night the hypnotizing sound of water will sing you to sleep. While in Columbia Bay you will enjoy a symphony of ice sounds. This trip is appropriate for intermediate and advanced paddlers, however beginners will find a thrilling challenge and all will experience the trip-of-a-lifetime. Embark on this unforgettable expedition in picturesque Columbia Bay, where the iconic Columbia Glacier, the largest tidewater glacier in Prince William Sound, calves towering icebergs into the water. Paddle amongst ice of all shapes and sizes, say hello to Sea Otters and Harbor Seals, and watch hundreds of different seabirds and ducks in this beautiful environment. We’ll paddle along the rugged coastline of Glacier Island, where the opportunity to see Humpback Whales, Orcas, Sea Lions, and Puffins awaits us. This adventurous journey continues along classic Alaskan coastline, where wildlife, wildflowers, cascading waterfalls and majestic mountains accompany us as we get closer to Valdez. We reach tranquil Sawmill Bay, and complete the trip following the Sawmill Bay to Shoup Glacier itinerary (see above). This trip is a classic Alaskan wilderness expedition! This trip has it all, camping by babbling brooks, shifting ice, waterfalls and rocky beaches. This trip is appropriate for all levels, however can be expected to be on the strenuous side for beginners. 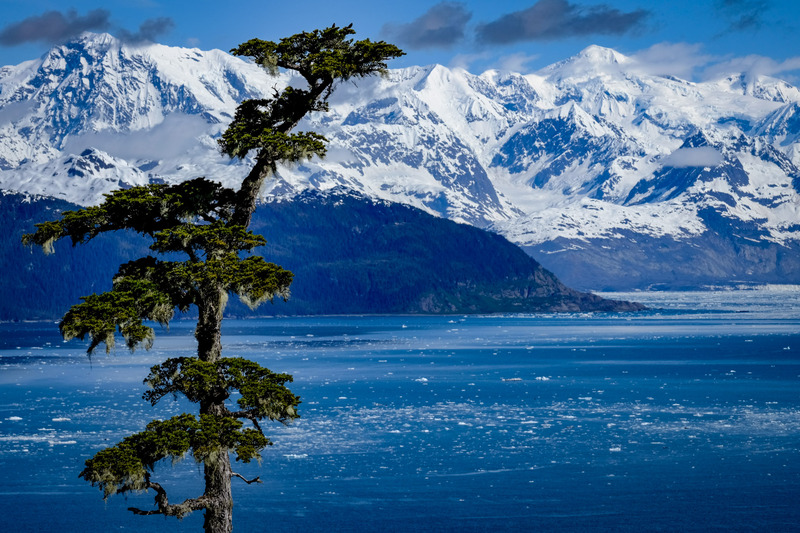 This once-in-a-lifetime trip offers the opportunity for adventurous souls to spend more time around the iconic Columbia Glacier, the largest tidewater glacier in Prince William Sound! Paddle amongst towering icebergs, spotting Harbor Seals and Sea Otters, sometimes lounging on the ice. Tranquil Long Bay is a jewel, offering exploration of old-growth boreal rain forest, cascading waterfalls and towering rock cliffs. Some consider this bay to be a hotspot for wildlife, including Humpback Whales, Orcas, salmon, and bear. Long Bay is also chock full of berries later in the season! Enjoy peaceful camping with the sound of shifting ice in Columbia Bay and be lulled to sleep by the sound of water flowing downstream in Long Bay. This trip is appropriate for all levels of campers and paddlers who wish to explore and get into the rhythm of a wilderness expedition. This trip is for those who wish to experience the exquisite beauty of a kayaking trip without having to camp out in the elements. Instead we will be based out of the lovely and cozy Prince William Sound Lodge, right on the water. Depending on which itinerary you choose, this trip includes Glacier Island and Columbia Bay day trips, as well as day paddles from the lodge, which may include paddling past the native village of Tatitlek. See above itineraries for details about Glacier Island and Columbia Bay. There are lots of opportunities for seeing wildlife on this trip, as well as paddling amongst majestic icebergs! You will have plenty of time to relax and gaze out over the serene bay, watching Sea Otters pop up to say hello, or enjoy hiking along the trails behind the lodge. The lodge offers comfortable sleeping arrangements in a lovely wood cabin right on the water. There is a wood-fired sauna, yoga studio and garden, where Chris, the owner and chef extraordinaire, harvests delectable greens to prepare gourmet meals! The food is excellent. This trip is appropriate for all levels of paddlers, and is especially for those wishing to enjoy the creature comforts of a cozy lodge. Maybe you’ve already been to the area and have new ideas of where to explore. . or you’d like to spend more time in a particular location that is not already offered in one of the above itineraries. . or maybe you’re a birder or photographer who wishes to spend more time in a prime spot. . not a problem! Contact me and we’ll create your perfect trip together. When is the best time to plan your trip? Well, it really depends on your trip goals. In my opinion May, June and early July are the nicest months to plan your trip, as these are typically the driest and sunniest months and offer the most hours of daylight. It is coastal Alaska, so it can always rain on us. However, you won’t get any star-filled skies or northern lights during this time. It’s too bright! The commercial fishing boats head out for a couple months starting some time in June or July. Some people enjoy the novelty of the boats, as they are quite picturesque and offer the unique opportunity to watch thousands of salmon being hauled up in nets. Mid-late July and August are typically the rainiest times, however there can still be sunny days. It starts to get darker earlier in August, which brings in beautiful long-lasting sunsets. I’ve seen the most impressive salmon runs starting in July and going through September. As for marine wildlife, I’ve seen everything throughout the entire season, however I’ve seen more Humpback Whales and Orcas earlier in the season. There are lots of colorful wildflowers and wild edibles starting in May through early September (depending on the winter’s snowfall, this can be towards later May) . If you’re into berry picking, August and September are the months to come. There are Salmonberries, Blueberries and Cranberries to fill your bellies and accompany our meals! Fall starts towards the end of August when the leaves begin to change. September is a lovely time to see the beautiful fall colors. This is when dark, star-filled skies return, as does the opportunity to see the spectacular northern lights! I’ve seen them starting in late August. Fall is when migratory birds take flight, so you won’t see as much bird life if you come this late in the season. As for icebergs and snow-capped mountains, no matter when you visit you will witness awe-inspiring majestic beauty all around you! I hope this information helps you to make your decision!